The fans should be happy. The Ravens traded a fourth-rounder to the Bills for Lee Evans–a downfield threat that is the perfect compliment to Anquan Boldin. As the Ravens focus more on offense, one can easily tell that they have made a big leap. After the cutting of players like Todd Heap, they had to get a little younger and a little faster on offense. Putting Lee Evans on the other side of Boldin makes this offense very dangerous and very tough to guard. Evans’ numbers in Buffalo may not have been wonderful, but the man had no one to throw him the ball, so he was basically out on an island hoping that the ball would be delivered to him remotely well on occasion. With this new placement in Baltimore, he can rest assured that Joe Flacco can get him the ball when it needs to get there. 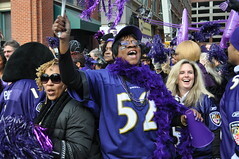 Now, does this allow the Ravens to compete? Well, with the destruction of the three-headed monster in the backfield, it’s hard to tell if they are moving away from the running game, changing around the running game, or going to a pass happy offense. If I had to guess, I think they’re changing the offense to more of a two backs and two receivers kind of thing. More balance. They’ve got two backs who can come out and break it for a big play, and now they have two major threats to go downfield and catch anything within reach. If I had to guess, I’d say that this could give the rest of the AFC North problems. Moreover, I’d say that the only team who can defend this combination is the Jets. No, I’m not saying the Ravens would go 15-1, but I AM saying that the Ravens got much better and they have become a much bigger pain for the teams that step on them in getting to the playoffs.